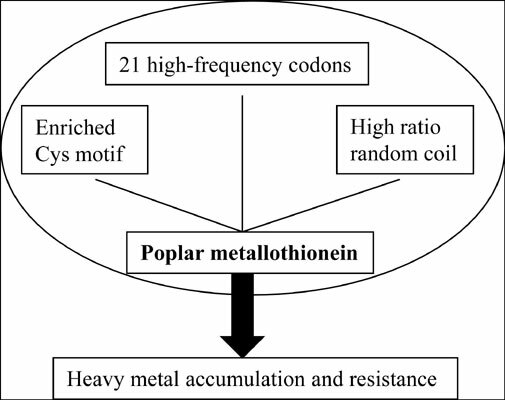 Background: Metallothioneins (MTs) are important proteins for phytoremediation, and are widely involved in heavy metal uptake, transport, and enrichment. Objective: The aim of this research was to clarify all the MT genes in Populus trichocarpa, and to determine their sequences, chromosome distribution, and codon-use preferences. The results of this study would further our understanding of the diversity of poplar MT genes, and be useful for clarifying the function of poplar MTs in remediating soils contaminated by heavy metals. Method: The sequence similarity of the poplar MT genes was conducted by using the software DNAMAN and the codon usage bias was analyzed by CodonW and CHIPS. Further statistical analysis on high-frequency codons were conducted for each type of MT. Results: Based on MT characteristics, 10 MT genes were identified and categorized into four types in the Populus trichocarpa genome. Their open reading frames ranged from 201 bp to 288 bp in length. The theoretical isoelectric point of poplar MTs ranged from 4.4 to 7.99 with an average value of 5.28. The amino acid similarity among poplar MT sequences ranged from 10.14% to 98.67%. A codon usage frequency analysis revealed a codon usage bias presented in the 10 poplar MT genes, with 21 highfrequency codons totally. Conclusion: These results reveal the characteristics of poplar MTs, and provide the basis for further studies on their functional mechanisms and applications in phytoremediation. Keywords: Populus trichocarpa, metallothionein, high-frequency codon, cysteine, poplar MTs, phytoremediation. Keywords:Populus trichocarpa, metallothionein, high-frequency codon, cysteine, poplar MTs, phytoremediation. Abstract:Background: Metallothioneins (MTs) are important proteins for phytoremediation, and are widely involved in heavy metal uptake, transport, and enrichment.